A dental emergency kit should make up part of your medical set-up in your preparations for an apocalyptic event. It will be unlikely that you will have access to any sort of professional dentistry care for the first few weeks or months, during which time any number of dental emergencies can occur. Your emergency kit will help to protect teeth and gums while also allowing you to deal with small injuries such as loose crowns, lost teeth and gum bleeding. Compact – you will have a larger medical first aid kit in your bug out bag to help you deal with minor injuries and the last thing you want is further space and weight being taken up by another emergency kit. Waterproof – as with any medical pack, you need to keep your dental emergency kit as water and wind proof as possible. It’s highly likely that in a survival scenario there will be pollutants in the air or that the weather will be extreme. Both of these can contaminate medical supplies if your kit isn’t waterproof. Accessible – when you’re dealing with a dental emergency, speed will always be important. This may be to stop the pain or to halt any bleeding as quickly as possible. You therefore need to have everything ready to go, making top opening zip lock bags a problem as you’ll have to hunt through everything. A better option is a side opening zipper bag so you have everything on display as soon as you open it. For such a key product, it’s actually surprisingly difficult to find a pre-packaged dental emergency kit for you to buy. Instead, you should think about buying the separate items as well as a pack to store them in. Orasol gel – this is the go-to gel for survival dentistry. It is filled with antibiotics and pain relievers specifically aimed at problems inside your mouth. Typical uses include to reduce the size of ulcers, remove irritation from dentures and braces as well as pain relief for mild toothache. A small bottle will set you back around $20 and you’ll find multiple uses for it. 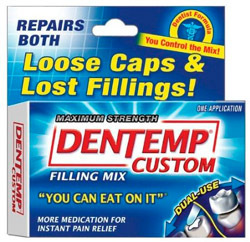 Dentemp – one of the biggest problems facing you as a novice field dentist is when people lose their fillings or crowns. Assuming that you are able to find and clean the missing piece, you can then use Dentemp as temporary fixing cement to put it back in place. A small two gram bottle only costs $5, but you’ll want to buy a few as it’s better to use more Dentemp and scrape away the excess rather than use too little and have the filling come loose again. Save A Tooth – this is a revolutionary new technology to help save teeth that have been knocked out. A tooth typically starts to decay 15 minutes after it loses contact with the nervous system, but storing it in a Save A Tooth container can keep it alive for up to 24 hours. It will be imperative at that point to try and find medical help as an open wound in the mouth can easily become infected and sore. These specialist products will help you cope with just about any dental emergency. You will also need to include plenty of cotton wool, antiseptic wipes, dental floss and tweezers in your dental emergency kit. A company called Traveler’s Supply offer most of these items as a set without a pack to store them in for $25 which is worth a look to get your dental kit started.